If you look at the T20 series, there were contrasting surfaces on offer in Ranchi and Guwahati. The surface in Ranchi was on the slower side and the Indian spinners made full use of it. They picked up three wickets and exposed the frailties of the Australian middle-order. The fast bowlers complemented them as well. Australia, who had been relying on David Warner and Steve Smith, had to do without their regular captain Smith in this series. However, they had Aaron Finch, who since his return from injury in the third ODI had been amongst the runs. Finch was the only batsman who could offer some resistance to the Indian attack in Ranchi with his 42 off 40. However, 118 on the board didn't make for a par total. The Australians might have considered themselves a bit lucky when the rain interruption curtailed the game to a six-overs-per-side affair. Things can get really tricky in these short run-chases. 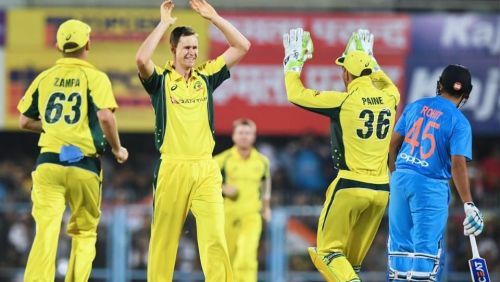 India were required to chase 48 in 6 overs and if Australia would have managed to bowl two good overs with two new batsmen at the crease, things could have been different. But India managed to win the game convincingly in the end. It was because they had restricted the opposition under 120 runs. There was a completely different surface on offer in Guwahati, at the Barsapara Stadium. I have had the experience of playing at the venue with the Assam Under-19 team who I was coaching last year. We practiced a lot there and played a game against Jharkhand as well, and I could make out that the surface assisted fast bowlers. Any left-arm fast bowler who has the ability to bring the ball back in to the right-hander is a dangerous weapon for any team. When he/she does that with pace, it becomes all the more difficult to face him. That's what Jason Behrendorff did. It's because whenever left-arm pacers bowl over the wicket, the angle tends to take the ball away from a right-handed batsman. But when the ball moves back in, it becomes lethal. This was what happened to Rohit Sharma in Guwahati. And if you take a look at Manish Pandey's dismissal, since Rohit was done in by an incoming delivery, Pandey expected the ball to come back, whereas it moved away and took the outside edge. Behrendorff, in only his second T20I, made full use of the helpful conditions on offer. He picked up 4 wickets in just three overs, which made it extremely difficult for India to bounce back. And then Adam Zampa got MS Dhoni stumped thereby further affecting India's chances to put up a respectable total. Also, it had been raining in Guwahati in the days leading up to the game, and hence, the moisture in the wicket and the movement in the air that was on offer were exploited by Australia. While chasing as well, despite losing Finch and Warner - the batsmen they relied on - early, Australia won the game easily. Full credit must be given to Travis Head and Moises Henriques, who tackled the spinners effectively despite having not scored many runs on the tour. It was a dominating victory for Australia - they chased the target down in under 15.3 overs. They took their time, built confidence as the innings went on, and then attacked the spinners when they were set. While it was disappointing to see that decider in Hyderabad had to be abandoned owing to an unsafe outfield, a small leeway must be given to the ground staff considering that it had been raining for seven days in the lead up to the match. And even after using the super soppers, some moisture remains on the outfield, which is why sawdust is used. The ground staff tried its best to make the outfield ready in time, but if the umpires feel that the ground is not fit, there is nothing that you can do about it. There is a definite scope for improvement. These days covers are used to protect the entire ground and not just the square. Perhaps a better drainage system would have helped. It doesn't take away the fact that a series decider was spoiled and thousands of fans returned disappointed. Sponsors would have also borne significant losses. But then when it rains, you can't really do much. Water may seep through the covers and wet the surface and may slide through the slopes as well. So we shouldn't be very harsh on the ground staff but we going forward necessary arrangements must be made so that in the event of no rain, play can go on as scheduled.